Perform a Dental Checkup at Home! Every six months or so, and sometimes sooner, you should visit your dentist for a professional cleaning and examination. 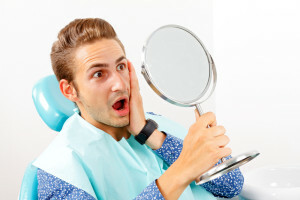 During the routine visits, your hygienist can clean your teeth of harmful plaque and tartar, and your dentist can diagnose any potential or existing dental health risks, like tooth decay and gum disease. Yet, you may not have to wait between your appointments to gauge how well your oral health is doing. In fact, if you know what to look for, you can perform a rudimentary dental checkup at home! The point of a dental checkup is to check for signs of trouble that you might otherwise miss. Still, common dental health issues cause a number of symptoms when they are in their earliest stages. If you notice any causes of concern, then you should schedule an appointment as soon as possible so we can diagnose the problem and help you find an appropriate solution. Tooth decay is the condition that causes cavities, or holes, to develop in your teeth. Decay begins when organic acids, often produced by the bacteria in dental plaque, attack and weaken the enamel surrounding your teeth. You might not spot signs of weak enamel at first, but you may notice one or more of your teeth becoming increasingly more sensitive. If a dark spot appears on your tooth, or if the enamel seems unordinary, then you may be at an immediate risk of tooth decay and cavities. Gum disease affects the soft pink tissues surrounding and protecting the roots of your teeth. When these tissues become infected by harmful oral bacteria, they become red and inflamed – a condition known as gingivitis. If you notice redness and swelling in your gums, or if they bleed when you brush your teeth, then gingivitis may have already set in. Left untreated, it will progress into destructive gum disease, and could lead to the loss of one or more of your teeth.